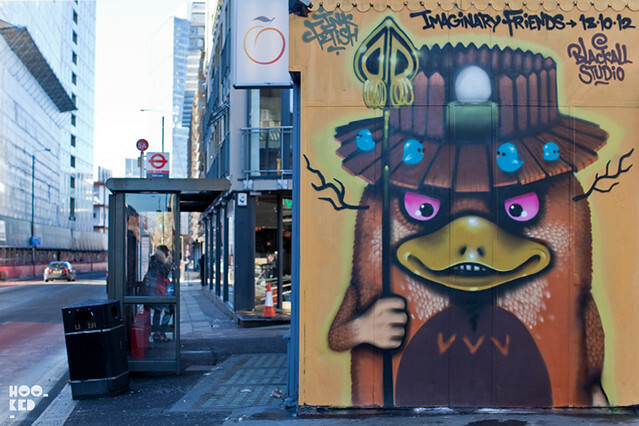 We have known Street/Graffiti artist Tom 'Inkfetish' Blackford for nearly as long as we have been running Hookedblog so we are delighted to see he is finally set to unveil his very first solo show 'Imaginary Friends' at Blackall Studios in East London on the 18th October 2012. "Imaginary Friends explores the mythologies of childhood, transporting celebrated archetypes of youth into a surreal adult world. Placing a veil of dark humour over icons of innocence makes Blackford's début an unmissable journey into a twisted world of strangely familiar characters." The exhibition will run from the 18th - 21st October 2012. This exhibition is supported by Global Street Art and Tiger Beer. To attend the opening night please e-mail: rsvp@globalstreetart.com — Once you've done that we then suggest you check out the short promo video below.